Our team believes that achieving a healthy and young looking skin is an essential part of any facial rejuvenation process. The skin is the largest organ in our body and plays very important role as target of multiple rejuvenation procedures. Our skin condition is a reflection of many different external and internal factors. 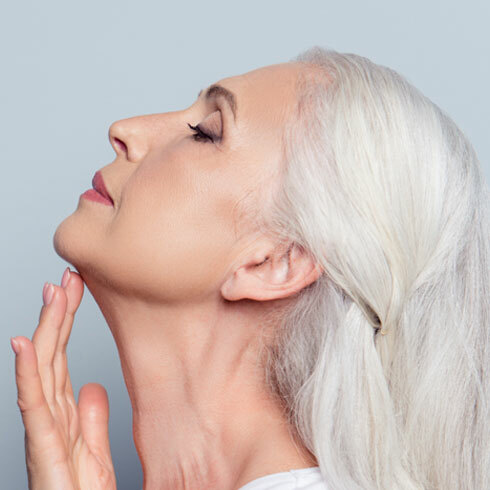 The deep layer (deep dermis) of the skin is mainly affected by external factors such as sun exposure and smoking but also by internal factors like menopause or bad eating habits. The cell turn-over and the capacity to renew fibres like collagen and elastin starts to diminish with age and takes longer than normal. This leads over time to a rough looking, deeply wrinkled and overpigmented skin. Our team has a lot of experience with many different deep peelings but we believe that a customized treatment gives the best result, so sometimes more than one type of peeling can be used in different areas of the face responding to specific needs (mosaic peel). Sun avoidance and specific creams depending on skin type. Normally deep peelings have a moderate downtime (10 – 14 days) and a low rate of complications if the patient is well selected and follows the recommendations of pre- and after care strictly. Normally only one session is required. It is a very good procedure to be performed alone or in combination with facial surgery. The skin preparation is a very important step especially if you have darker skin. The skin wil be prepared during 6-8 weeks with products stabilizing the skin and diminishing the melanocyte activity. Aftercare is also important to avoid prolonged healing, infection and hyperpigmentation. Sun avoidance during 3 months post treatment and constant sun protection afterwards is paramount to aftercare along with specific creams to use at home. Are you a good candidate for Deep Peelings ?